All you can eat. Dine-in only. No Sharing please. A combination plate of chicken dishes with rice, bread, & meats of the day. 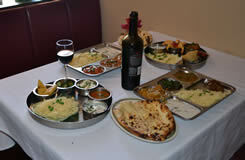 Meat & Vegetable Thali available for same price. A combination plate of vegetables with rice, bread, & vegetables of the day. All luncheon items are served with one serving of the following: cabbage, rice, & spiced iced tea. Tandoori chicken and fish tikka. Served with rice and naan. Scallops & shrimp korma with rice and naan.